Here I am. No, I haven’t entirely disappeared from the face of the earth. Life has been pretty busy, but none of it seems all that blog worthy. This year’s summer has seemed busier than usual, with lots of time spent with the grand kids and doing basic running around. As I sit here this morning with the fire going for the first time this season and the rain pattering on the sunroom roof, I find that I’m actually looking forward to the colder days of fall and the chance to curl up inside with my needles. I’ve done a lot of cleaning out and rearranging in my sewing room lately. Yeah, I know you’ve heard that song before! This time it was in response to some soul searching about where I want to go with my sewing/quilting. 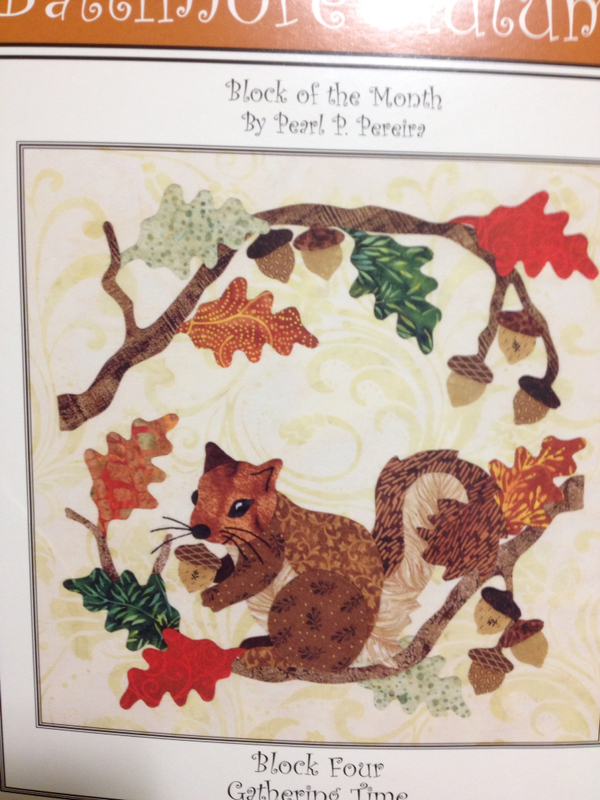 I’ve debated whether I wanted a new embroidery machine or a midarm quilting machine. I had decided that I really needed to get good at machine quilting if I was ever going to finish all the quilt tops I have. I know I need to practice, practice, practice to ever get any good at it and I have. And hated every minute of it! This caused me to reflect back on my hand quilting days and the joy that I always felt when I sat down to the quilting hoop. After much much reflection, I have decided to return to hand quilting. All my tops may never get finished, but I will love the ones I do and most importantly, I will love the process. 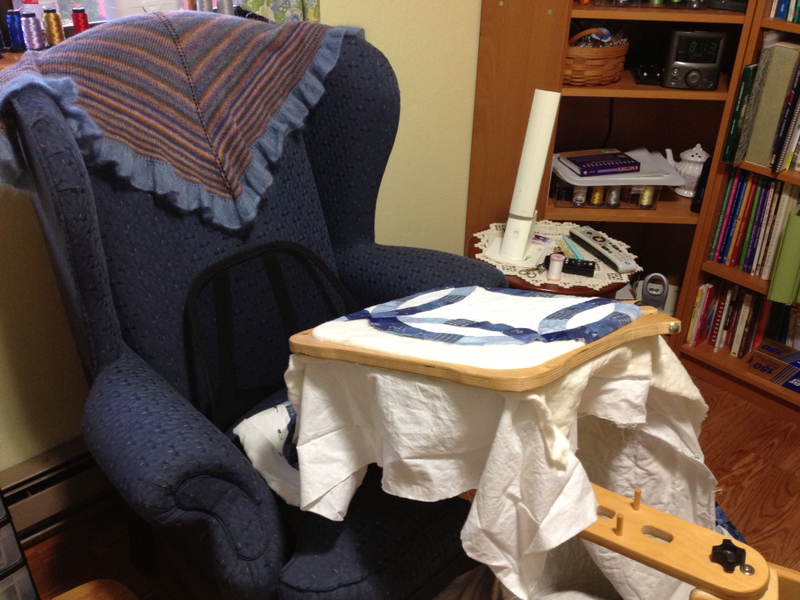 So I rearranged my sewing room to provide a nice cozy spot for quilting. First up is to finish the Double Wedding Ring that’s been languishing forever. We’ve had the same hand quilted quilt on our bed for 20 years, so I think It’s time for a change! Depending on how much time I have to work on this, It should be done in about a month. 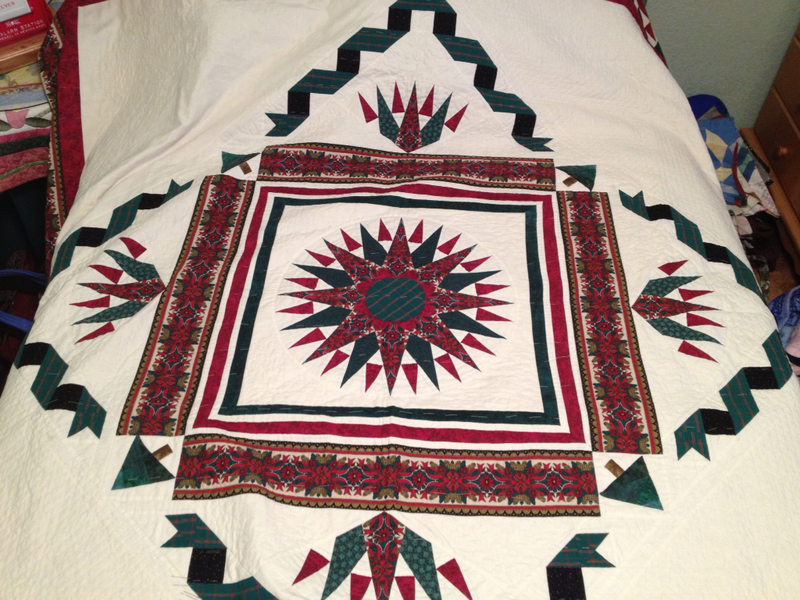 Next up will be to work on one of my Round Robin quilts. 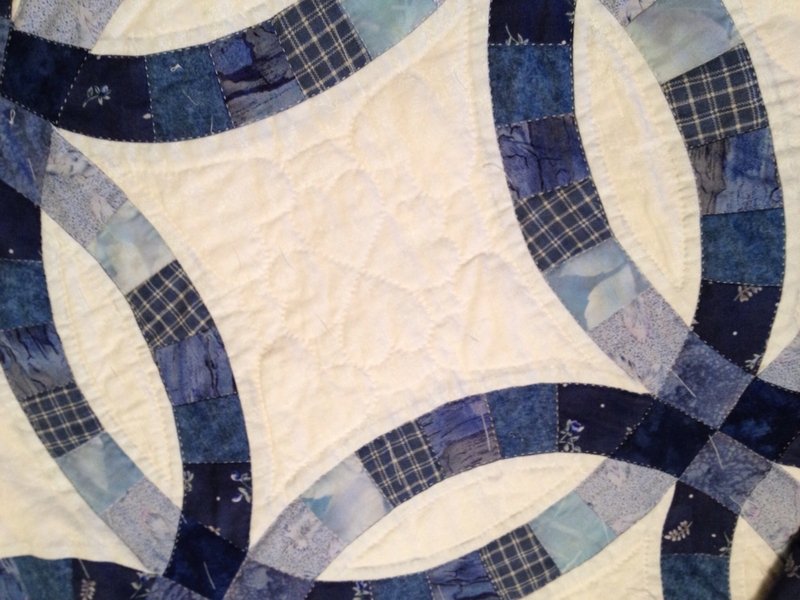 I pieced the center and my friends added the rest, leaving me lots of room for hand quilting. I’m also getting up the courage to start a rather ambitious appliqué project. I enrolled in a Block of the Month a year ago. I now have all the blocks, but hadn’t yet got the courage to even open them up. When I attended the APWQ show in Tacoma, I met the lady who put together the block kits and she gave me some hints and encouraged me to “Just Do It!” This is the first block up. Never fear that I’ve given up knitting. I’ve been slogging along on Fire Dance. The rows are SOOOO long now – it takes me almost 1-2 hours to get around, depending on the number of beads. But I am seeing the light at the end of the tunnel and can look forward to casting off that bad boy sometime next week. Here it is in all its amorphous beauty! 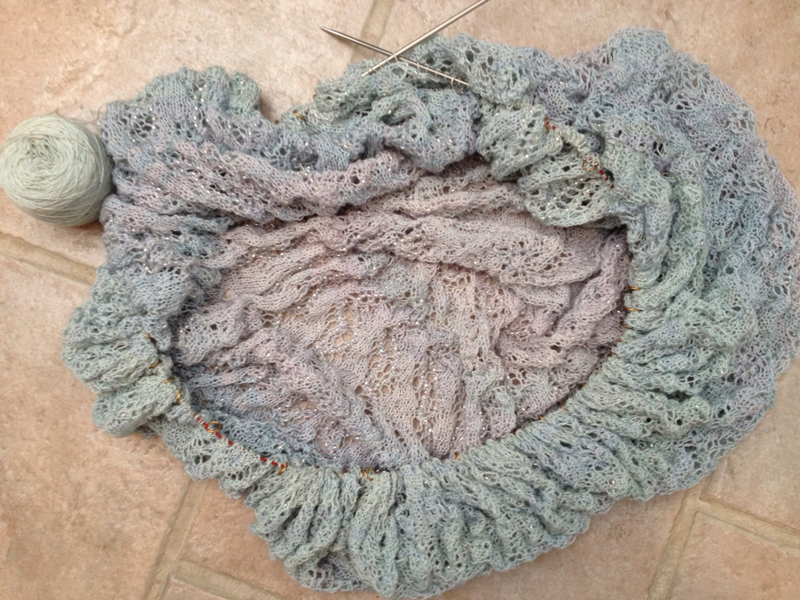 I have other projects going, but none that I can show – the Watership Down Mystery Knitalong and a stealth gift project. And, of course, Christmas is approaching fast and I need to consider if I’ll be doing any knitting for that. Did I say summer was busy? Fall and winter are shaping up to be busy too, but in a different way. Bring it on!